It has been half a year, come to think of it. 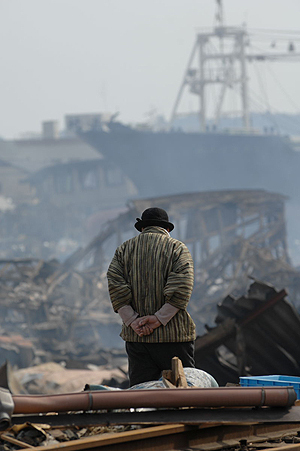 Fukushima still suffers from the massive scars inflicted by the earthquake, tsunami and radiation. Today, many people live one day at a time with both hopes for future and concerns weighing heavily on their shoulders. Even after six months, the fear lingers in our hearts: We don’t know how much the invisible radiation is harming our health and environment. We may not put it in words, but it’s there with us, day and night. The district that I live in is not designated as an evacuation zone. But even as autumn approaches, no bugs are seen around the street lamps at night. Tiny insects and moths come near the light trap and cause electric buzz at this time of the year, but not this year. Quite a number of small birds have also disappeared. The Japanese government, Tokyo Electric Power Co. and the highly-regarded scholars…they all say that the water, the air and the food are “safe because the radiation level does not exceed the standards.” If that is true, I’d like to ask them to please move and live in Fukushima. Please hold all your conferences in front of the nuclear power plant. Bring all your family members and relatives, too, and together live with us and eat the crops grown on this land. say that everything is safe. It is easy to pollute and to destroy, but it is very hard to restore what is already lost. I just hope from the bottom of my heart that we can all live in peace and resume our routine lives filled with our children’s laughter any day now.